The spindle assemblies are responsible for turning the mower blades. They are powered by the drive belt and pulleys and are subject to general damage and wear. Bent, damaged, and unbalanced blades can further damage the spindle assemblies. If they are too damaged, they should be removed and replaced. I have been ordering parts for my BoB Cat mower from Jacks small Engines for 6 years now and they have always gotten them right. I installed the spindle and it was just what needed to get my mower going again. everything went into place. Price was not bad either! This is the second time I have order from Jacks Small Engines and so far never had a problem receiving it within a short time or with the parts I ordered. Thanks, don't believe I could of got the part at my local parts house any cheaper and everything work out just right. 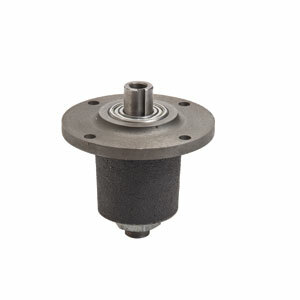 Ask us about the Oregon 82019 Spindle Assembly. Please no repair questions. Your Q&A may be posted to Jackssmallengines.com to help other shoppers, like you, with their purchasing decisions. Thank you.